What event(s) are you currently training for and what does that include? I am training for 3 rides: Bike the River Valley in July, The NYC Century Bike Tour and the Twin Lights NJ Century ride, both in September. Leisure in nature, these are three 100 mile events that will be challenging in altitude, elevation and terrain. I am also training for three endurance obstacle runs: Mud Run a 6.2 mile run for multiple sclerosis in August, Spartan Super Run 8 plus miles in September andTough Mudder Tri-State 11 miles in November. These runs consist of obstacles (fire pits, live voltage from wires, etc.) and challenges designed with military influence to test strength, endurance and ability; and usually tons of mud! What are your personal goals for this year? I want to complete each event I sign up for, improve my performance each time, and challenge myself beyond my current abilities and step up to the plate. More importantly I want to have fun! I’ve partaken in many bad habits in my 20s. I’ve worked hard to stop and replace most of them with healthy alternatives. As I go along, I want to improve my health and fitness level. These challenges are difficult yet fun ways to do so, which makes them twice as rewarding. What does your weekly workout out look like? Right now, I average about 150 - 200 miles per week on my bike, about 7 hours in the gym (spin sprints/climbs, tabata Intervals, boot camp and weights/kettle bells). Since I’m running more now, I’m increasing my runs to 3-4 days per week. I tend to bicycle 4 days a week and gym 4 days a week. The one day I don’t train is Wednesdays. I need that mid week recovery day. 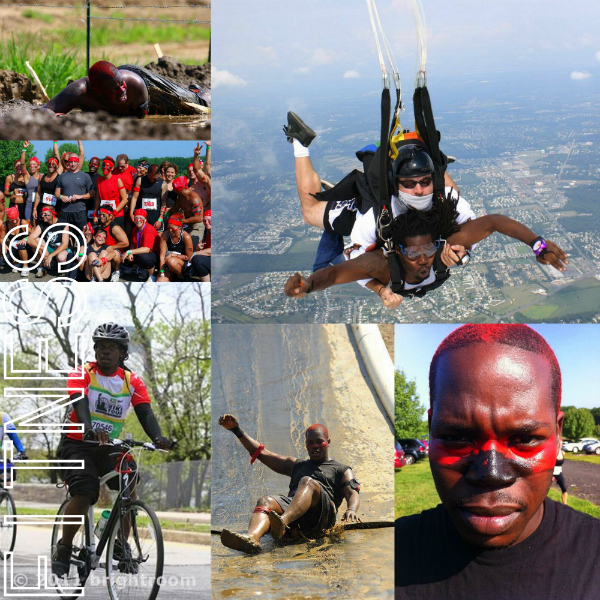 What do you think is the hardest part about training and doing an endurance event? The hardest part about training is being consistent, especially when athletics is NOT your career. I work about 70-75 hours per week between my main role and side jobs/initiatives. Socializing, family, dating, school - there are MANY potential derailments. You must keep your eyes on the prize, sacrifice some things for your goals. Another thing that’s hard is knowing when to plateau. There’s definitely such thing as overtraining. It has many negative effects like easier susceptibility to injury, actually getting injured and reaching the point of diminishing returns (meaning the more you train, the less you improve and/or the more you actually decline). Listen to your body. Don’t be afraid to plateau. Build some muscle memory, conditioning versus moving on too fast and hurting yourself. What benefits/rewards do you get from competing? Health! I feel so much more alive and great physically when competing. It’s also a great form of stress relief. Accomplishment! There’s few greater feelings on Earth, to me, than pushing for a goal outside your comfort zone and getting it done. Camaraderie! Competition breeds friendships, encouragement and rivalries, all which form a positive sphere of challenge and success. You also have a group of folks who understand the training, pain, sacrifice and joy that comes with training, performing, winning, and just completing an event. What advice would you give someone looking to compete? DO IT NOW! You’ll get rid of a bad habit or three. You’ll accomplish something you might not have done. You’ll surprise yourself at what you can accomplish. First things first, find a sport that interests you. Give yourself 10 bonus points if you’ve never done it before. Next, watch it on TV, websites, etc and get excited. If you still want to do it, find a team or a training facility and sign up! Then set a couple of goals; short-term, mid-term, long-term. Don’t worry about sucking or anything. Trust me, my initial run times SUCKED. It’s all good. Only place to go from there is up. Lastly, make sure you have fun doing it! Faith: Can we really change?